Package Contains: Conditioning Mineral Hair Masque - 250 ml / 8.5 fl.oz. Deep Cleansing Mud Shampoo - 350 ml / 12.0 fl.oz. Conditioning Hair Cream - 250 ml / 8.5 fl.oz. Package Contains: Advanced Micro Capsule Serum - 30 ml / 1.0 fl.oz. Purifying Magnetic Mud Mask - 50 ml / 1.7 fl.oz. Package Contains: Aromatic Mineral Salt Scrub - 450 gr / 15.8 oz. Protective Hand Cream - 100 ml / 3.4 fl.oz. Mineral Rich Body Lotion - 250 ml / 8.5 fl.oz. Mud Cleanse Shower Gel - 350 ml / 12.0 fl.oz. This terrific trio makes skincare as easy as 1-2-3! First, cleanse your body skin with the botanic cream wash, then pamper it with the mineral body lotion, and finally soothe your hands with the mineral hand cream. What a feeling! Kit Contains: AHAVA Mineral Botanic Cream Wash - 500 ml / 17 fl. oz. AHAVA Mineral Hand Cream - 100 ml / 3.4 fl. oz. AHAVA Mineral Foot Cream - 100 ml / 3.4 fl. oz. Package Contains: Mineral Moisture Perfecting Cream (Normal to Oily) - 50 ml / 1.7 fl.oz. Moisture Fix Eye Gel - 50 ml / 1.7 fl.oz. Essential Purifying Mud Mask - 100 ml / 3.4 fl.oz. Deep Cleansing Mud Gel - 100 ml / 3.4 fl.oz. Package Contains: Mineral Enriched Moisturizing Cream (Normal to Dry) – 50 ml / 1.7 fl.oz. Skin Renewal Facial Peel - 50 ml / 1.7 fl.oz. Deep Cleansing Mud Gel - 220 ml / 7.5 fl.oz. Package Contains: Age Defying Pearl Mask - 50 ml / 1.7 fl.oz. Mineral Active Moisture Cream (Normal to Dry) - 50 ml / 1.7 fl.oz. Age Defying Night Cream (Normal to Dry) - 50 ml / 1.7 fl.oz. 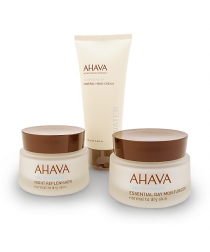 This AHAVA trio of Dead Sea products will treat your hand, foot and body skin to a new experience! 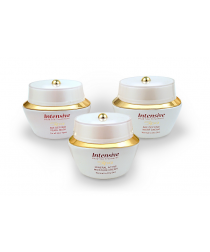 Each of these complementary creams is rich in active ingredients that synergize to repair and rejuvenate skin. Go ahead – pamper yourself! Kit Contains: HAVA Mineral Hand Cream - 100 ml / 3.4 fl. oz. AHAVA Mineral Foot Cream - 100 ml / 3.4 fl. oz. AHAVA Mineral Body Lotion - 250 ml / 8.5 fl. oz. Each of these remarkably matched creams works hard to revitalize problematic hand, foot and body skin. The AHAVA Dermud Intensive formula was specially created to restore optimal health and appearance to dry, sensitive skin. You owe yourself this Dead Sea treat! Kit Contains: AHAVA Dermud Intensive Hand Cream - 100 ml / 3.4 fl. oz. AHAVA Dermud Intensive Foot Cream - 100 ml / 3.4 fl. oz. AHAVA Dermud Nourishing Body Cream - 200 ml / 6.8 fl. oz. Package Contains: Expression Marks Anti Wrinkle Cream - 50 ml / 1.7 fl.oz. Exfoliating Emulsion - 120 ml / 4.05 fl.oz Cleansing Cream - 250 ml / 8.5 fl.oz. Package Contains: Essential Day Moisturizer (For normal to dry skin) - 50 ml / 1.7 fl. oz. Night Replenisher - 50 ml / 1.7 fl. oz. Hand Cream - 100 ml / 3.4 fl. oz.